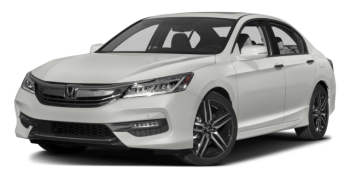 The 2016 Honda Accord Touring is luxurious, powerful, and executively styled — Goshen and Monroe drivers off all stripes will find a lot to love in this premium sedan. Whether you’re looking for exceptional comfort or cutting-edge technology, the Accord Touring is able to provide. Here’s a quick overview of what you can expect. Power: A state of the art 3.5 V6 engine purrs authoritatively beneath the hood, ready to provide drivers with an output of 278 hp and 252 lb-ft of torque. You’ll cruise confidently, overtake easily, and get up to speed quickly. The 2016 Honda Accord Touring’s premium powertrain will satisfy Goshen and Monroe drivers who crave high-end power, but the vehicle’s interior is what will really take your breath away. Trimmed in deep, rich leather, and with heated seats in both the front and rear, it delivers a first-class experience during every drive. The driver will even enjoy a 10-way power-adjustable seat with power lumbar support and two-position memory settings. Premium Sound System: With 7-speakers, a subwoofer, and 360 watts of power. Honda Satellite-Linked Navigation System: With voice-recognition technology, HD radio, and Honda HD Traffic. Body-Colored Parking Sensors: Ultrasonic sensors mounted at the front and rear making maneuvering easier than ever. Collision Mitigation Braking System: Applies corrective braking in order to avoid a collision. Road Departure Mitigation System: Monitors your position on the road, then warns you if you begin to leave it. 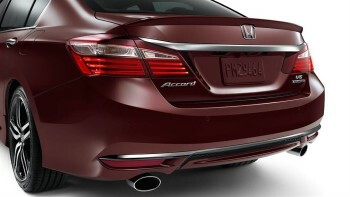 Forward Collision Warning: Scans the area ahead of your Accord, then provides an alert if a collision becomes likely. Lane Departure Warning: Warns you if you stray from your lane without signaling. Lane Keeping Assist System: Applies corrective steering if you don’t respond to the Lane Departure Warning system. Adaptive Cruise Control: Adjusts your cruising speed to account for the distance between your Accord and the vehicle ahead. Any drivers looking for a spacious sedan that still offers a thrilling drive and an unprecedented selection of standard features should strongly consider the 2016 Honda Accord Touring. It’s available now at Middletown Honda, so visit us today to find out more. We’re conveniently located near Goshen and Monroe, so come see us soon!